Thanks in large part to fierce protest on the part of consumers concerned with non-sustainable palm oil, the food giant Ferrero has announced that it will be obtaining 100% of its palm oil from traceable segregated, RSPO-certified sources by the end of 2014, a full year ahead of its previously announced schedule. Ferrero, which manufactures popular treats such as Nutella, Tic-Tac, and Ferrero-Rocher chocolates, is just one of dozens of snack food manufacturers, representing a $432 billion annual industry, that are now facing heavy criticism for using non-sustainable palm oil in their products and therefore driving the rapid conversion of Sumatran Orangutan habitat into palm oil plantations. 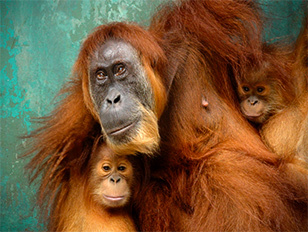 For more information or to add your voice to the chorus calling for palm-oil reform, visit http://ran.org/palm-oil. Found you thru a post by Ian on Linked In. Serengeti, but it may be a cognate and example in how to move from video to stills to supportive captioning. I was an Interpretive Park Ranger for the National Park Service, also worked with National Park Service in Ecuador. My Masters is in Environmental Ed. On your coverage of palm oil, and other mass extraction industries, it’s time for “destination” ecotourism itineraries to bring guests to places of devastation as well. We need to get people into the middle of rainforests in the Amazon and Indonesia being wiped out by bulldozers and mass forest removal, to watch the animals falling, crushed and fleeing the scene. I agree completely! I was a tourist in Bali Indonesia, by myself in a sandalwood forest, enjoying the amazing animals and the beauty, went off in the not too far distance I heard the sound of chainsaws. It shocked me and left a very deep impression that has continued from that day in 1993 to present!